What are Fly Eliminators? 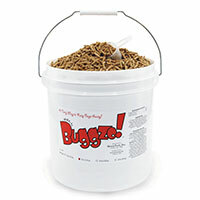 The best fly control on the market! Order Now! Gnat-sized parasitic wasps that feed on and breed in developing (pupal) stages of filth breeding flies. 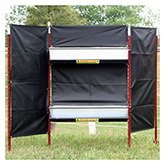 Fly Eliminators are used by horse and livestock owners to eliminate flies before they hatch into adults. 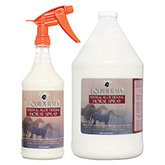 Fly Eliminators do not bother horses, cattle, livestock, pets or plants. Watch our short video showing How To Use Fly Eliminators Around Your Property. 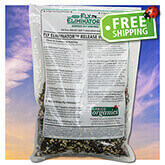 Click Here for additional information about the Fly Eliminators. Remove manure and treat heavily urinated areas. 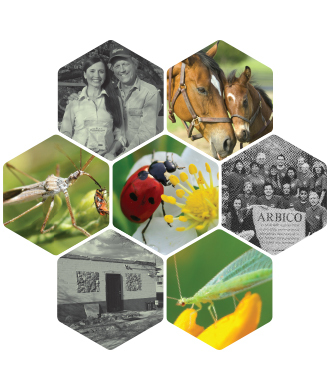 Odor control will help eliminate fly breeding habitats. 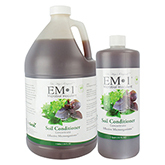 EM-1: Microbial spray used to reduce and eliminate fly breeding areas. The bacteria in EM-1 breaks down decaying organic matter that attracts adult flies. 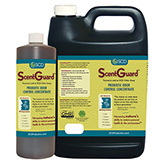 SCD Barn Kleaner/SCD ScentGuard: Work similarly to EM-1. 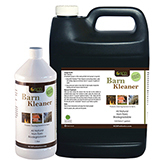 Barn Kleaner can be applied directly to manure to speed up decomposition. 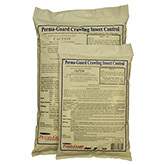 Compost waste, repair leaking water and keep food storage dry. 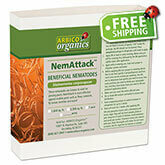 Use Beneficial Nematodes near manure and other "hot spot" breeding areas to control maggots. 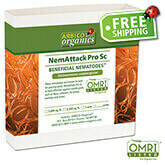 NemAttack - Beneficial Nematodes, Sc: Beneficial Nematodes parasitize a wide variety of common pest insects including the maggot stage of flies. After two weeks, noticeable reductions in target pest populations will occur. 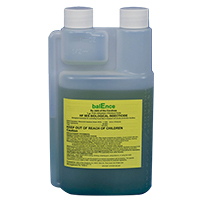 balEnce Fly Spray: Treat breeding areas and stalls with balance Fly Spray to kill maggots as they develop. 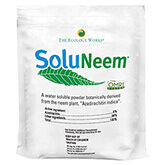 Contains a beneficial fungus used for insect control in gardens, farms and livestock settings. 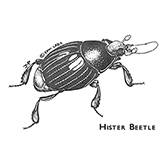 Hister Beetle: Commonly released in poultry facilities as a biological fly control. Hister beetles feed on fly eggs and larvae (maggots). Both larvae and adult hister beetles are predatory. 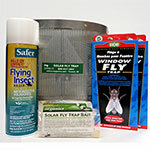 We recommend trapping adult flies and spraying your animals for effective control of adult flies. 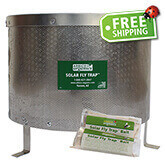 Solar Fly Trap: Our #1 Selling Fly Trap! 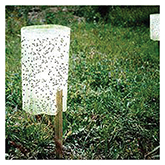 This long-lasting aluminum trap attracts and traps adult flies with a yeast bait. Each trap comes with 1 bait pack, enough for 5 weeks. Simply rinse the trap out and add more bait to use it from season to season. 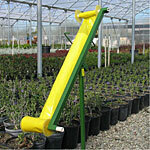 Insect-A-Peel System: Use in barns, fields, gardens, and greenhouses. 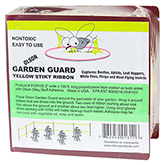 Exposes 300 square inches of yellow sticky trapping surface designed to attract pest insects of all kinds. 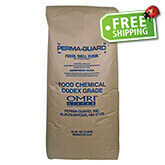 Effective in a 2,500 square foot area and lasts 20-25 weeks. 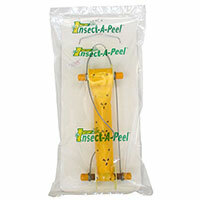 Yellow Stiky Tape: Hang in barns, around pastures and other areas with large fly numbers. Sticky on both sides and can be cut to fit spot treatment uses. 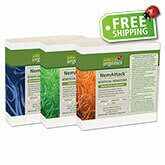 Add essential oils as attractants for specific pest insects. 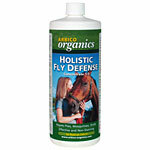 ARBICO Organics Holistic Fly Defense: Essential oil based insect repellent for horses, livestock and pets. 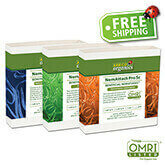 Holistic Fly Defense repels manure flies, biting flies, mosquitoes and more. 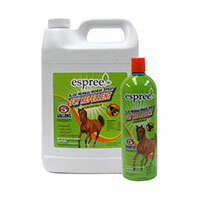 Espree Aloe Herbal Horse Spray: A favorite of horse owners! A non-irritating repellent spray that uses essential oils to repel flies. Rinse off after every third application.